1. Do not take the limo to your hotel from the airport. Go up to the top floor of the Airport, walk outside, and take a metered taxi. You probably won't spend more than 250 baht (about $8) on a taxi, if you take the limo, you'll probably spend about $25. The other option is the airport train, which takes you into the center of Bangkok, and is connected to the BTS line. If there is only one of you, this is a little cheaper than the cab and you're sure to avoid congestion, if there are two or more, you are likely better off taking a cab except during rush hour. 2. Take the BTS and subway everywhere- Far quicker than waiting in Bangkok's heavy traffic, and cheaper. At rush hour however, you will have be standing shoulder to shoulder on the trains. If you're in Bangkok for any number of days, make sure to invest in a card with pre-paid trips, so you don't have to spend your time plugging the machine for tickets every time. 3. If you plan to visit sites outside the city like the Tiger Temple, or the floating market, far better to rent a driver for the day than to go with a tour group. You'll avoid having to go to overpriced stores the tour company has deals with, and you'll get home more quickly. Bangkok rush hour traffic is miserable, and you don't want to wait while 10 other people are dropped off in front of you. 4. DO NOT accept a ride from a tuk-tuk driver for a price that's seems too good to be true. What he'll do instead of dropping you at your destination, is take to some tailor where you'll feel pressured to buy something. Just not worth the "savings." 5. If you do take a taxi within the city limits make sure to take a metered one. I only have one recommendation for this, go to the Vasu Exchange, by the BTS Nana station between Soi 7, and Soi 11. Exchanging money there is nearly commission free. Where the exchange rate at the Airport might be 29.5, at the Vasu Exchange it will be 31.2 (Thai Baht to U.S. Dollar) I have looked at over 100 exchanges, and nothing else comes close. Or if you don't want to use currency you brought, use the ATM (which would cost a fee of course from your bank and the corresponding ATM's bank. Bangkok consists of high end malls, like the Siam Paragon Mall, with amazing architecture, name brand stores, and a state of the art movie theater, as well as merchants hawking their wares on the street. Prices here are typically much better than in the West, but make sure to keep your wits about you. The good news is, in Bangkok if you get ripped off it is generally for small amounts of money, a couple of dollars here, a couple of dollars there, but beware of people trying to sell you second tier quality for first tier prices. Overall though, the shopping experience in Bangkok is a lot of fun, and you can find excellent gifts to bring back home that are not readily available in the West. So many places choose from, my recommendation is to go on and go agoda.com and read the reviews. Most places come as advertised, and you can find a wonderful hotel for $60 a night. Two such hotels are the Metropolitan, although the location is more catered to the business consumer and a tad more pricey than others, and Dream Hotel on Soi 15, which has a far superior location. Many hotels (including The Dream Hotel) will give you a 10% discount if you just show up and pay in cash. You will find excellent food in Bangkok. Everything from Indian, to Western, and of course Thai cuisine is available generally at bargain prices. An excellent place to eat is the food court at the Siam Paragon Mall, where you will get a vast plethora of choices, most of which of are generally healthy, and be you'll be hard pressed to spend $7. Also, the MBK food-court is another excellent choice. When I am in Bangkok I generally subsist on coconuts, mangoes, and jack fruit, which can be easily purchased on the street. You can also get tasty cooked, sit down food directly from street vendors, both cheap and tasty. You will not go hungry here, that much I promise! 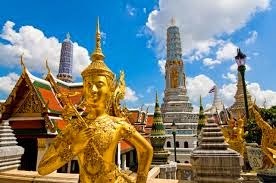 Overall Bangkok is a very vibrant city, with a lot to offer, and it doesn't take a lot of money to have fun. If you have any thoughts, comments, or added suggestions please feel free to leave them in the comment section below.